Indyanna–Rich makes the point that the difference between 1963 and today is that 1) the political crazzy is national, not just regional, and as you said, 2) the John Birchers et al were quite marginal in the Republican party of 1963, whereas the modern analogues are in the van of the Republicans (& even arguably the tail that wags the dog) rather than marginal now. The atmosphere of Dallas was shrill, strident and hysterical? What an interesting choice of words. No expertise but I lived through the era. Without refreshing my memory of the Warren Commission report, I suspect the big obstacle they had to linking the atmosphere and the assassination was the fact that Oswald had tried to kill the right-wing General Walker a few weeks earlier. Walker was quite prominent on the right, so you’d have to argue an atmosphere of violent rhetoric legitimizes the violent impulses of any nutcase. But then you need to account for the attempted assassinations of Presidents Ford and Reagan. Yeah, that seemed like some pretty silly hyperbole to me, Bill. Thanks for your perspective. OK, this is a question more than a comment and I’m not a historian and not up on this period and I remember the JFK assassination and I remember being too young to understand who or even what he was, or what or where Washington, DC was. But. Is this why he was so idolized? The idea that he’d be able to smooth things out and be younger and more energetic than Eisenhower? I always wonder, given his policies, why he was so beloved by people who were soon to join the real left. It’s weird (again, I don’t understand US history very well) but: there were actual Communists and fascists, real divisions etc. here in the 30s and earlier, and I also notice a fairly wide (though not that wide) diversity of *views* now (even if differences between viable parties are less wide). But it would seem that in those early 60s there really wasn’t *that* much divergence in views? Or the shape of things was just so different that Kennedy looked really good? These are undergrad type questions, I know, but I’m really lost here and would like enlightenment. The question from Z gets an interesting treatment in King’s book, but I’m going to suggest that people read the book to see how it develops. The “idolization” of JFK (which Chris Matthews has turned into high farce shilling his book) is a combination of New Deal Get Things Done, the accession of the WWII order-takers to the White House (from JFK to Bush 41, the longest run of any one generation as presidents), the willingness to spend the victory dividend on Big Things. But for LBJ getting bogged down in Vietnam (something that JFK supposedly had doubts about) that dream might have been realized. Thus King’s book. OK I will have to read book. I am convinced JFK was weird and idolization of him was misguided but I would really like to figure out what these peoples’ point of view was, then. I did understand the 1964 election, we were to vote LBJ, “integration not escalation” – hah. Soon it was “hey, hey, LBJ, how many kids did you kill today” and mace. Then 4 or 5 more years and everyone was “working within the system” and so we got to now. Yet it seems that if you were born in the 30s or 40s JFK really looked good. If you want to learn about the assassination, Read “Libra” by Don Delillo and don’t bother reading anyting else. The comparison to the bible might be a bit much, but Manchester was one of if not the most prominent public intellectuals and popular biographers of the twentieth century. He is actually more famous, both in public and among historians, for his biography of MacArthur (American Caesar) and the incomplete two volume heroic biography of Winston Churchill (The Last Lion). I grew up in a middle class suburban household, spent a lot of time at other middle class homes, and for better or worse I don’t think I’ve ever seen a living room library that lacked at least one Manchester book. Z: The “idolization” is mostly post assassination hype, with a bit of Cuban missile crisis thrown in. Arthur Schlesinger had to write a piece in the midst of the election justifying why JFK was better than Nixon. Eleanor Roosevelt and the die-hard Stevensonians were lukewarm going in. JFK was slow on signing the fair housing EO and was stymied in the House for the first 2 years of his term. From the Cuban missile crisis on he was more impressive, particularly the American U speech on detente and his belated push for civil rights. The assassination and all the pageantry around the funeral account (JFK jr saluting), the long lines for the viewing, the 24 hour news coverage (remember, no cable TV, no Cspan, so it was all Walter, Huntley and Brinkley all the time), it all fed the legend. Remember too that all of JFK’s personal defects were basically unknown; all good liberals thought rumors of his Addison’s, his womanizing, his consorting with spies, were strictly right-wing propaganda and a smear campaign. And the mainstream media basically filtered all that stuff out of the public discussion. While I admit to some nostalgia for bits of JFK’s wit (Obama has his cool, but not his wit) LBJ is my man. Knowing his background, I cried at his “We shall overcome” speech. One of only a few tragic figures in American history. I’ll try a few less histrionic pre-assassination factors in Kennedy’s popularity (not idolization). There was a generational element that preceded even his election, in his appeal to the younger half of the WW II generation, veterans at or below his own rank of Lt., who had *not* been career soldiers in the long run-up to that war, for whom the slick inauguration phrase “torch is passed” summarized a doubtless much more prosaic sensibility. This was amplified by a degree of self-congratulatory satisfaction about the resolution of the “Catholic issue,” even, or maybe especially, among non-Catholics. The stylized “touch football on the White House lawn” stuff and advocacy of “50-mile hikes” might seem pre-fabricated now, but it resonated after repeated coronary scares in the Eisenhower terms. The glamorous spouse and cute kids in the White House certainly contributed. And yes, the frisson of possible mass extinction in the Cuban Missile thing definitely changed the whole game. My father, an apolitical protestant from Republican cultural terrain just slightly older than Kennedy was visibly animated into his camp from midway through the primary season on by nothing you could put into a punchy television spot today. (This surprisingly recurred much later in his still-apolitical, seemingly agnostic life, to the point where I retrospectively considered him to have been a “Kennedy-Clinton Republican”). The assassination just added elements of deification that give revisionist history more room to work now. Apropos of which and not much else, the newest addition to the ranks of “instant historians” is Bill O’Reilly (who–not having a t.v.–I surmise to be some kind of a commentator??). He has co-written a supposed boke called _Killing Lincoln_, about which one blurbologist in a huge ad in the NYT yesterday gushed “add historian to Bill O’Reilly’s already impressive resume.” Anybody can join this club, I guess. Well, my first political memory is that my mother took us (aged c. 8, 6, and 18 months) up to 125th St and Park Ave. during the 1960 campaign. All I remember is all the motorcycles. But there was definitely enormous enthusiasm (it was an election rally), and I remember my parents getting up the morning after the election and knowing that Kennedy’s election was a good thing. Why? I think they assumed he’d be better than Eisenhower had been, and certainly better than Nixon would be. I don’t think particular issues were in the cards, though I can ask my mother tomorrow! The assassination was just shocking, and for a 9 year old, quite terrifying. I see: young, not Eisenhower, not Nixon, also not Joe McCarthy, Catholic issue resolved, etc. – I get it, at least sort of. Thus the wish to turn back time (the Silent Generation’s version of July 3, 1863, just before Pickett’s Charge). But even Stephen King recognizes the more powerful forces at work. Karlson: “…achieved only discord….I don’t know how much of that was wishful thinking about the Great Society.” Medicare/Medicaid was the lasting legacy of the Great Society, which meant both the single biggest reduction in poverty traceable to government programs, but also a major change in family structure (the aged could live on their own, didn’t need care from their daughters). LBJ achieved in civil rights legislation more than JFK ever proposed. I’d toss in another meme here: “the end of innocence” (IMHO America loses its innocence regularly.) Looking back, JFK is the first of the assassinations which marked the 60’s. His death preceded the major race riots of 64 and after, not to mention the turmoil of the anti-war movement, and My Lai. So to some, looking back, what preceded 11/22/1963 appears rosy and innocent, while what followed was storm and fury, signifying nothing. Note I’ve no idea whether there’s any support for that in the histories of the era. Harshaw: just my non professional memory operating here, but that is what I remember also, esp. 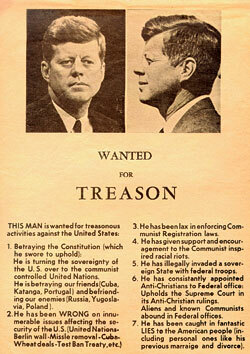 re JFK assasination as an inauguration of an era of these. I also think it’s wishful thinking that JFK would have scaled back Viet Nam but other than that LBJ was *impressive* for the reasons you state. Side note and gossip: at the LBJ library/museum in Austin they have a telegram from him to Lady Bird’s father. Did you know they eloped? I did not. Telegram is from San Antonio and says they are married and will be across the border in Monterey, N.L., Mex. by morning and not to worry! Explains how we moved to a national security state since then and this fascinates me: as superficially or perhaps “socially” we got more liberal (with stuff like gay rights) we were actually moving in this direction. Huxleyan. Harshaw: “LBJ achieved in civil rights legislation more than JFK ever proposed.” That becomes a Stephen King plot twist. “Medicare/Medicaid was the lasting legacy of the Great Society, which meant both the single biggest reduction in poverty traceable to government programs, but also a major change in family structure.” Worked well for the early recipients, but the contingent claims (with or without Part D, whether Part D was a Republican poison pill) over the next fifty years are the single largest component of the U.S. borrowing problems to come, and the Medicare reimbursement formula removed a lot of price competition from medicine. That’s really stuff to talk about at my place, not here. I just started reading 11/22/63. I have only read one or two of his books. I’m not a “Tea Party” member but lean that way. I got to the part where he describes the ad talking about the “Tea Party Society” saying (paraphrase) “Socialist agree with integration, think about it!) Much of his book, he takes the time to describe the era , settings and thinking of the time. I am not very familiar with this so when I saw he attributed this racist ad with the “The Tea Party Society” very similar in name to The Tea Party I decided to look it up and see if there was more information on it. Well I guess he made it up. Why? He is a fiction writer so I guess that is what he does. Were his other writings in this book stating time period ideas, scenery and products also made up? Why did he decide to create this misleading idea. How many people would take this literally and have their opinion slightly influenced? Well maybe that was the point. I know he does plenty of research on his subject matter, guess he ran out of truthful references. Zach–I agree with you that it’s needless agitprop to try to connect the Tea Party of 2009-2011 to conservative (and pro-segregationist) movements and organizations from 50 years ago. I think the Tea Party has been often rather mindlessly and unfairly accused of racism by some lefties. However, it it manifestly the case that conservativism in the early 1960s was very committed to preserving segregation where it existed & that it was in part a racist movement (the John Birch Society, the Citizens’ Councils of America-type groups, and even the National Review-type establishment conservatives, for example.) So while I agree with you that King’s connection to a tea party-named group was needlessly provocative, it wasn’t inaccurate to identify racial grievances as something at the heart of conservativism in the early 1960s.